Eyesight problems, medically termed “refractive errors”, are common. 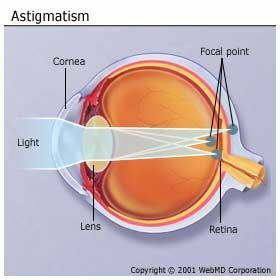 With astigmatism, another common refractive error, the light is distracted to multiple areas of the cornea. Refractive errors can often develop within a few months and they occur mostly in the early teenage years and in the mid 40’s to 50’s. During the teenage years (ages between 10 and 13) the eye ball experiences a great deal of growth and can genetically grow too long, this is often associated with myopia. In the 40’s it is the aging process that leads to a relative shortening of the eye ball and this is associated with far-sightedness (hyperopia) that leads to the necessity of reading glasses. 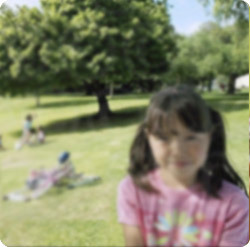 With uncorrected myopia (nearsightedness) your eyesight would be blurred as shown in this link. Objects in front would be in focus, but the objects in the distance would be blurred. Myopia is the visual condition in which only nearby objects appear in focus, much like a camera permanently focused at a close distance (Nearsightedness = without glasses or optical correction only near objects, typically when held very close to the eyes, are sighted). Nearsightedness is caused by either the eye being too long (axial myopia) or eye having too much refractive power (refractive myopia). 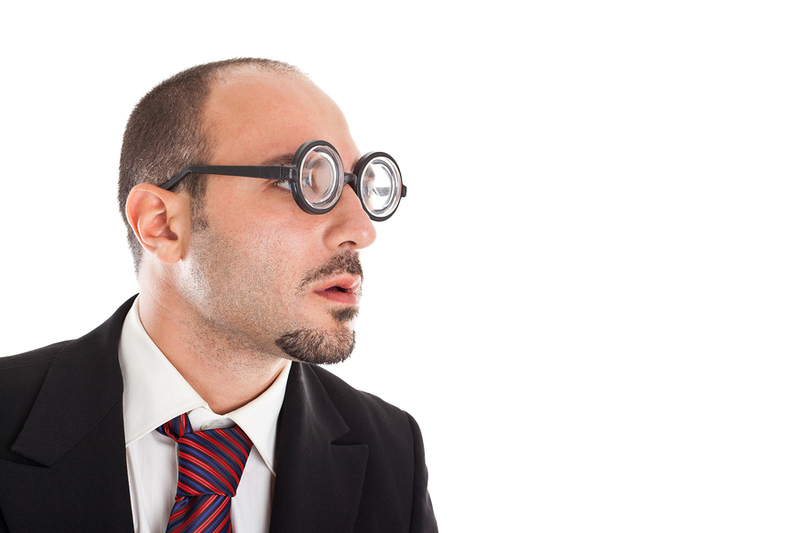 With hyperopia (farsightedness), however, the patient sees the distance clearly. In this example seen through the eyes of a patient with farsightedness the man up front is not in focus. Note that the tree and the buildings in the background in the distance are clear and focused. The patient has a problem reading a newspaper and the arms feel too short to be able to focus on the print. Reading glasses help the patient to see the print in focus again. With astigmatism the surface of the cornea in these patients is not like a perfect globe, but rather like the asymmetric shape of a rugby ball. This is illustrated in this link (thanks to www.tedmontgomery.com for this image). The vision before correction would look like this(uncorrected astigmatism, thanks to www.harisingh.com for this image), where the image not in focus in the front or the back. All of it is blurred because the cornea has different curvatures.However, after correction for astigmatism (thanks to www.harisingh.com for this image) the same image looks as shown in this link. The following link explains more about the diagnostic tests regarding astigmatism (thanks to http://www.yorku.ca/ for this link). The simplest test to check the overall vision is a visual acuity test (thanks to www.tripod.lycos.com for this link). Using eye charts the doctor or optometrist will determine which of the letters or numbers you can still accurately read (20/20 vision is perfect) at a certain distance. Here is another site that explains this (thanks to www.allaboutvision.com for this link). 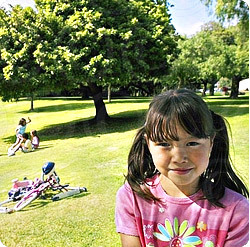 Glasses and contact lenses (thanks to www.stanfordchildrens.org for this link) are the main conventional means of correcting visual problems such as myopia, hyperopia and astigmatism. However, there are operative methods (refractive surgery) that can now be used, although they have their strengths and weaknesses. It is tempting to throw away glasses and contact lenses and have clear vision after refractive surgery (so the commercial goes). But there are possible complications, such as a certain percentage of cataract and glaucoma formation following these surgeries and a weakening of the cornea making the eye more susceptible for rupture with physical trauma. 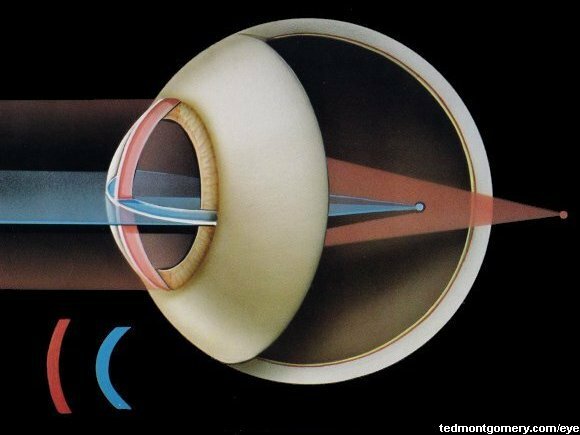 Here is an image of the cornea before and after laser surgery, which makes you realize that the cornea is thinner after the procedure. If you would like to explore refractive surgeries, discuss this with the eye surgeon carefully and weigh the pros and cons. For my part I decided to continue to live with glasses.